Can Valve’s grab-bag of southern comfort and zombie goodness overturn Infinity Ward’s steamroller of an action blockbuster? Click on for our pre-release feature face-off. The once populous combat arena of Winter 2009 is an echoing shell. A few notable action franchises still circle in the shadows, IPs like Assassin’s Creed 2 and Pandemic’s plucky original The Saboteur, but the vast majority have migrated to the over-subscribed stomping grounds of Spring 2010. There in the centre of the unspoiled, uncontested sand stands the usurper, M16 dangling absently from one hand. Despite contentious server support and pricing decisions, Modern Warfare 2 seems to have won the struggle for Christmas revenue before it even begins. But has it? There are inhuman shrieks from the auditorium, a confused surge of rotting bodies against the barricades. Left 4 Dead 2 has had its own battles to fight on the road to release, against Australian ratings boards, disgruntled fans and over-sensitive US newspapers, and the Infected are in no mood for further upset. Posted in Features, FPS Gamer, and tagged with Call of Duty: Modern Warfare 2, comparison, face-off, feature, fps, Left 4 Dead 2, one on one. l4d2 is winner based on intelligent game play making it interesting 6-12 months from now….cod same thing over and over promoting a braindead mindset…lol…Cod turns ppl into zombies we can practice killing in l4d2!! 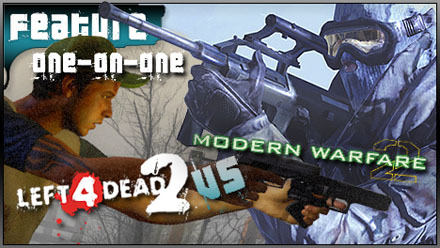 Left 4 Dead 2 is way better than Modern Warfare 2. It the type of game you can still enjoy playing 2 or more years down the road as if it was your first time playing. I’m not knocking Modern Warfare 2 but Left 4 Dead 2 gives you more enjoyable gameplay that promote teamwork to its max. Left 4 Dead 2 all the way baby!!! I don’t think it is even fair to compare the weapons between the two games. In L4D2 these are weapons that you could pick up in real life. Everyday people don’t have all these military weapons at their disposal. Also, I’m pretty sure that in real life after you kill so many opponents in a row you don’t get the option to have your radar point out where the others are hiding, or have a plane drop bombs or whatever. It is pretty sad that I am going to say this…but I think the post-apocalyptic zombie shooter is more realistic than a game based on the military. My vote goes to L4D2 because of the realism and just all around better gameplay.